Sign the petition to demand Justice for Kevin Clark! 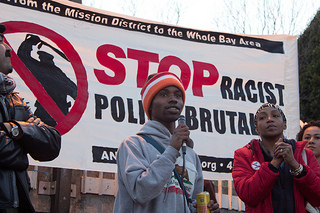 With a banner reading “From the Mission District to the whole Bay Area—Stop Racist Police Brutality,” over 300 community members rallied against the most recent case of police violence in San Francisco. The event was prompted by a video that became widespread showing 18-year old CCSF student, Kevin Clark, being brutalized by two SF police officers. The heinous assault was carried out in broad daylight at the busy intersection of 24th and Mission St. BART plaza. The video shows Clark peacefully walking down the street when a police motorcycle drives onto a crowded sidewalk in an attempt to run Clark over. Another cop jumps off his motorcycle, tackling Clark and throwing him face down onto a sewer grate in the street. As one cop pushes Clark’s face into the grate, the other twists his arms in a “compliance hold” and handcuffs him. Outrageously, the SFPD charged Clark with “resisting arrest” without ever saying why he was initially being arrested. With only three days notice, a wide range of organizations, community groups, and individuals rallied around the demands to drop the charges against Kevin Clark, fire and charge the SFPD officers who brutalized Kevin with assault, and release the police report on his attack. Organizations and individuals on both sides of the Bay (see list of endorsers below) came together to show the cops that we will not be silent in the face of police violence in our communities. Students and youth of color from John O’Connell and Balboa High Schools, and City College of San Francisco, the college Kevin is currently attending, showed their support in large numbers. 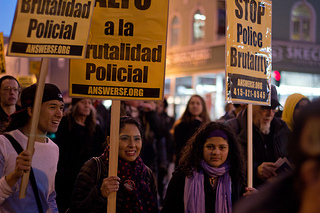 From police harassment for fare evasion on public buses—the enforcement of which cost the city millions of dollars of much needed transit funds—to the constant harassment of Latino street vendors who have to work in constant fear of the police confiscating their goods, to the fight back against “stop-and-frisk” and taser laws, the speakers spoke out against the general assault on the most oppressed communities in the supposedly progressive city of San Francisco. The important presence of the East Bay anti-police brutality movement showed that San Francisco does not face this fight alone. There is a growing Bay Area-wide movement willing to come together to push back against the police. Kevin Clark addressed the crowd, saying “I didn't think this would have this big an effect on the community, but it looks like it's made a huge impact so I just want to thank everyone for coming out and supporting me and for all the work that ANSWER and the other coalitions have been doing to get this event on the road and everyone knowing about it. So thank you and hopefully we can fix this and make the streets safer and people won't have to worry about the police harassing them.” Marcela, a former teacher of Kevin’s from CCSF, described him as an excellent student and a genuinely caring young man. With an exaggerated police presence surrounding the participants, the disciplined and organized march shut down two lanes of the busy Mission Street chanting, “SFPD, Stop Police Brutality” and “No Justice, No Peace! No Racist Police!” The demonstration was supported by people in cars, on balconies, and those walking home from work. Many joined the march. It was clear that the resentment towards the police in the Mission was widespread and that people needed an outlet to express their grievances. The action was covered extensively in the media and has set the stage for future organizing by Kevin Clark and his supporters. It is clear in the video of the police assault that the only assailants and violators of the law were the cops who will justify their brutality against youth, people of color, and all poor and working people by using their media mouth pieces to slander the public image of their victims. They did this with Oscar Grant, Kenneth Harding, Alan Blueford, Ernest Duenez, Mario Ramiro, Ramarley Graham, Sean Bell and countless others whose relatives continue to speak out for justice. Now they are trying to do the same to a young man by the name of Kevin Clark, who, unlike the previous victims, is still standing. The movement will stand in his defense. Endorsers of the Feb. 7 action incuded: Kevin Clark, ANSWER Coalition, Coleman Advocates for Children and Youth, Justice 4 Alan Blueford Coalition, Justice For Mario Romero Foundation, Kenneth Harding Foundation, Idriss Stelly Foundation, International Socialist Organization ONYX Organizing Committee, Poor News Network, POWER (People Organized to Win Employment Rights), SF Bay View, WORD (Women Organized to Resist and Defend) and the Party for Socialism and Liberation.